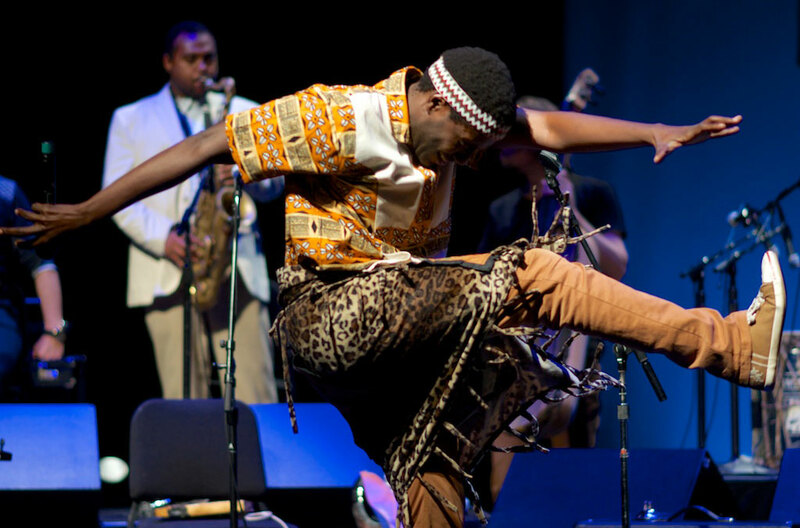 Afropop Worldwide’s program “Inside the Nile Project” takes listeners behind the scenes of perhaps the most unusual African ensemble to tour the United States in 2015. 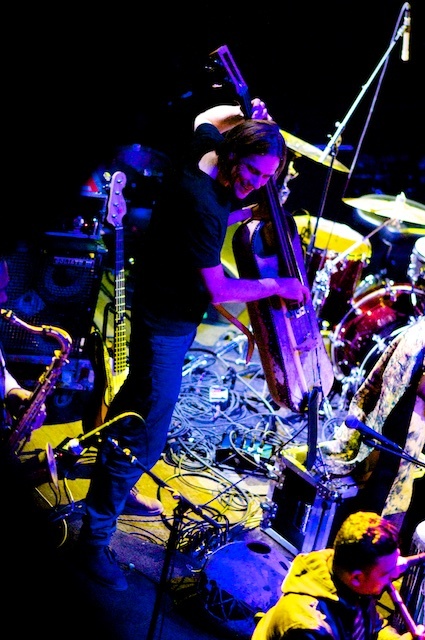 The program is a collaboration between producers Ian Coss and Banning Eyre, both of whom spent time with this multinational touring group at points during their four-month U.S. tour. 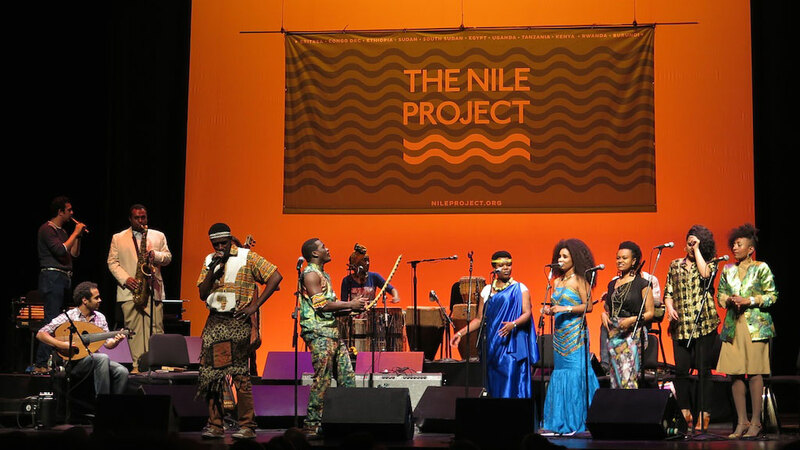 For more on the story, here are excerpts from Ian’s and Banning’s interviews with Nile Project co-founder and CEO, Mina Girgis, its musical director Miles Jay, and a few of the remarkable musicians who participated in the 2015 manifestation of the ongoing Nile Project. 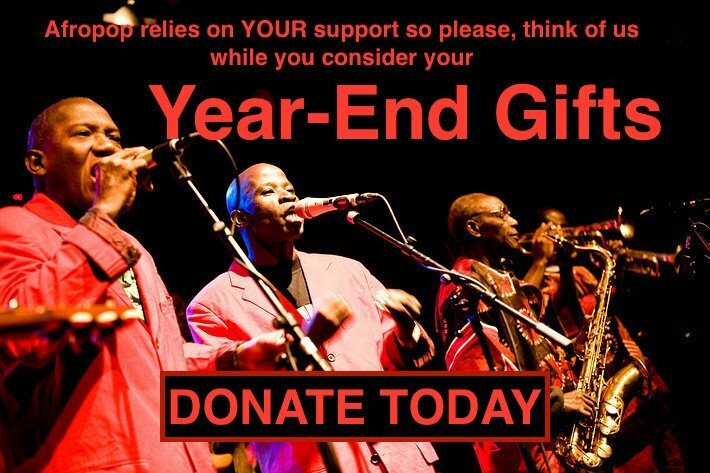 For more on all the musicians in the Nile Project and its future plans, visit nileproject.org. 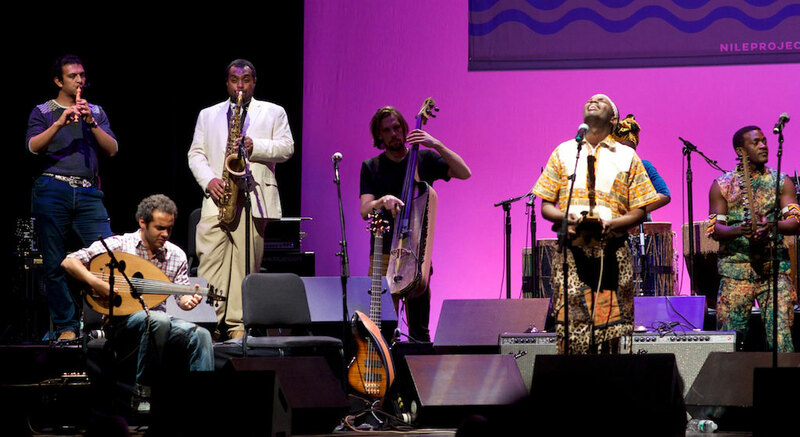 The photographs in this feature are by Banning Eyre, from two concerts: the group’s first U.S. performance at New York’s globalFEST in January, 2015, and from one of their last concerts of the tour, in Princeton, NJ, in May, 2015. 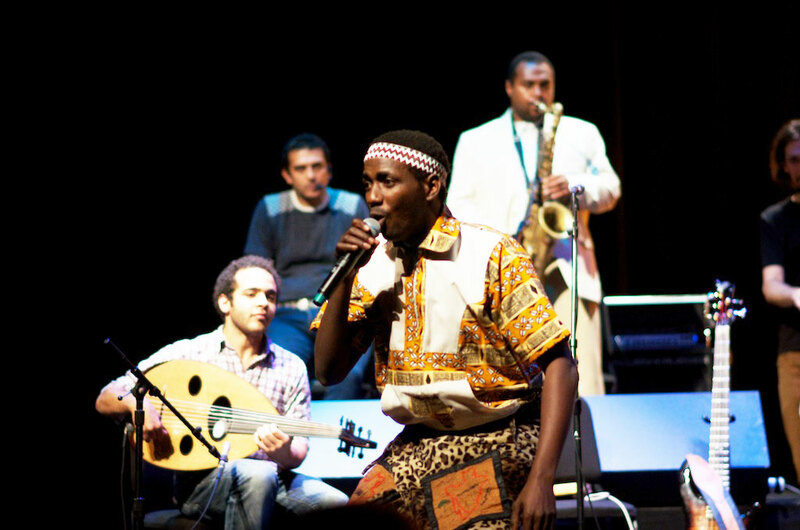 Mina Girgis: The Nile Project is an initiative we started about three and a half years ago to bring musicians from the 11 Nile Basin countries to collaborate on music that merges many of their traditions and styles and instruments. So we have musicians from Uganda, Kenya, Uganda, Burundi, Rwanda, and from Ethiopia, from Sudan, and from Egypt. And we are using this music to inspire a larger conversation about water and about all the challenges we face in the Nile Basin. The problem has been that many of the countries in the watershed have not been seen as part of the same region. So you have Egypt, which is considered part of both North Africa and the Middle East. You have Sudan and Ethiopia, and then you have East African nations, Kenya, Tanzania and Uganda, which are considered sub-Saharan. All these countries are really connected with others from their cultural regions, but they haven't seen themselves as part of the same community. So for us, the music that we’re putting together is a way to get all the people in the Nile Basin to start recognizing how much they have in common. Obviously, this an environmental corridor that is the cradle of civilization and it has connected these cultures for thousands of years. So there's plenty to work with here that may not have been connected in the recent times. That's the work we’re doing—bringing those connections to life. We put together these Nile gatherings, two-week music residencies that happen once a year, and we invite musicians to come to these residencies and participate in workshops where they teach each other about their musical traditions. It's really a school for musicians from all the Nile countries. 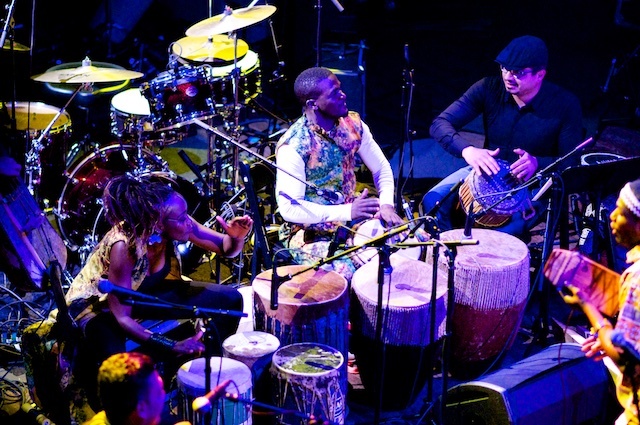 The Egyptians learn polyrhythms from Uganda. The Ugandans learn the maqam system [a set of ornamented musical scales] from Egypt. Everybody starts exchanging musical traditions and understandings. So when they’re composing together, it's coming from a deeply understood place. It's not just one person riffing and another person playing a solo on top of it. This process creates music that is slowly cooked, as opposed to quickly pulled together. The way we go about it is deeply collaborative. We invite people to start working together in smaller groups, two people, three people at a time, and looking at ways were they can combine their modal and rhythmic systems. 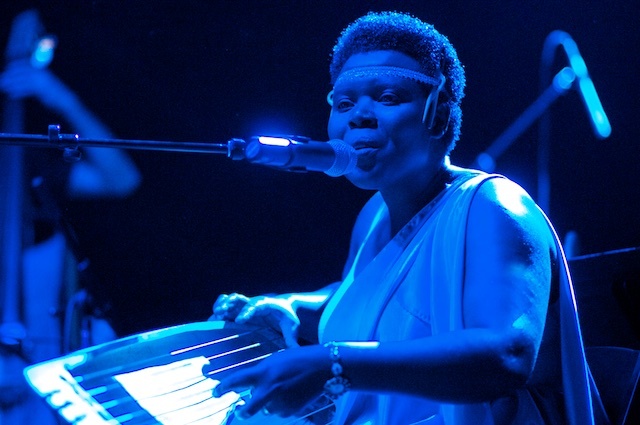 They can start focusing in on simple musical ideas, and these seeds eventually grow into larger groups, and ultimately, the whole Nile Project ensemble. Dina El Wedidi (Egypt): I am from Cairo. I'm a singer and musician. I started my career five years ago, and I've participated with the Nile Project since it started. Our first residency was in Aswan, Egypt, three years ago. I didn't study music. I graduated in Turkish and Persian Oriental language studies at Cairo University. So I did my music career on my own. My whole inspiration came from Egyptian folkloric music. It's very rich music. I am not trying to recover it, but I just try to be inspired from this rich folklore in Egypt to do new, imaginative work. I'm trying to make original stuff related to and inspired by the Egyptian sounds that I really like. Starting from the north to the south in Egypt, we have totally different kinds of music. So this has also inspired me in the Nile Project. I've been learning a lot of things in the last five years. Before, I didn’t have any chance in Egypt to collaborate with African musicians. Usually we participate with European and American musicians. So for me, it was the first time to get in touch with the real scene now in East Africa. For me, I start to love so much the African identity as Egyptian, because usually we are near to the Arab culture more than the African culture in Egypt. Now, as I love the oriental stuff, I really love the African stuff too. Here is a personal experience I have to share with you. This is what happened. In the second year of the residency, I was in Kampala, Uganda. I came very late in the night so when I woke up and I hadn’t met the musicians. And I woke up and I found a very beautiful woman singing in the morning in a very magical way. So I was, "Oh, who is this girl that's going to sing with us?" Her name is Selamnesh Zemene. 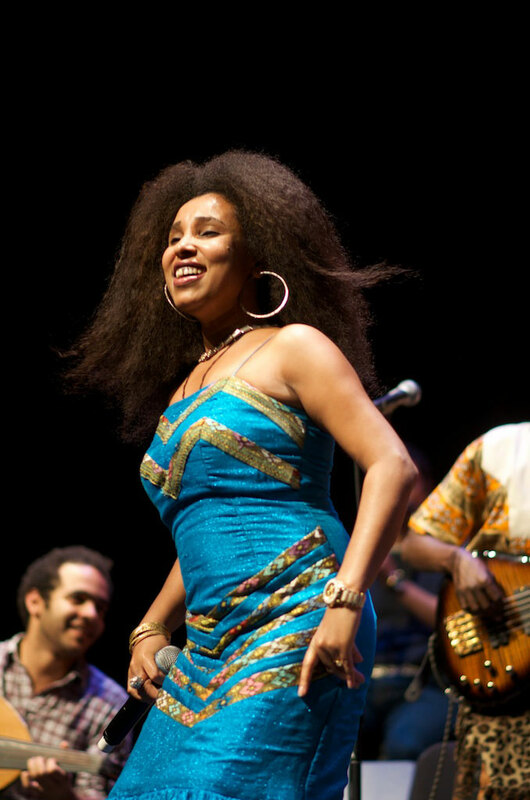 She is an Ethiopian singer and she's working with us in the Nile Project. And I heard her voice. She was singing in a beautiful scale, an Ethiopian scale called ambassal. It's very near to our Egyptian scale called hijaz. So I fell in love with this scale. I fell in love with her singing. And I started to ask her, “This is an amazing song. Can you continue?” That same day I composed one song, inspired by the scale and this girl. I mixed the ambassal with hijaz, and we create this song together, inspired by her singing. For me, it was the first time to compose very fast like that. I named the song "In Wonderland." Stephen Sogo (Burundi): My name is Stephen Irambona, but they call me also Sogo, so I prefer to be called Stephen Sogo. Sogo means “old man.” Actually I'm 31. But when I was little boy, they told me that I used to walk like an old man, so this is how this name came out. Anyway, I'm a Burundian musician, a composer as well. I'm playing a lot of instruments, especially traditional instruments from my country. In this project, I am playing ikembe and umuduri. Ikembe, it looks like a thumb piano; in central Africa they also call it mbira. Umuduri, it looks like a berimbau from Brazil. I'm also an electric bass player, and I have four albums. 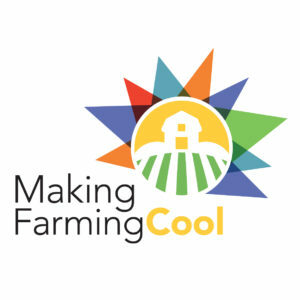 Before I joined this project, I didn't know exactly what I would meet. So when I met these guys, for the first time I heard Egyptian music and Ethiopian music, it was like, “Wow, what is this?” It was disorienting in my ears. So I started learning this music, and trying to understand it. For a year, I practiced. Yeah, but I didn't feel good. Because you're playing something you are not used to playing. You have to make some sacrifices to hold yourself and try to find some feeling, and to enjoy this music. Even though you've learned it, you have to feel it. It took me time. But now I can say I'm very lucky. I can feel it, and I can enjoy and understand it. So for me, the Nile Project has been like a school, a music school. In my country, you can listen easily to American music, to some African music like Kenya Tanzania, Uganda and South Africa. But that's it. I never listened to Egyptian music or Ethiopian music. In Africa, we have this problem, we don't listen to each other. That's a big challenge we have. I'm lucky to create my own music, to focus on our traditional music, but also I'm lucky because I have learned to listen to this Egyptian and Ethiopian music. And now, in Burundi, the whole country knows that I've joined the Nile Project. People are getting aware of this, because Burundi is the southern source of the Nile. So now, some videos from the Nile Project are shown on TV, and people now are becoming aware of these other Nile countries. It's really interesting. 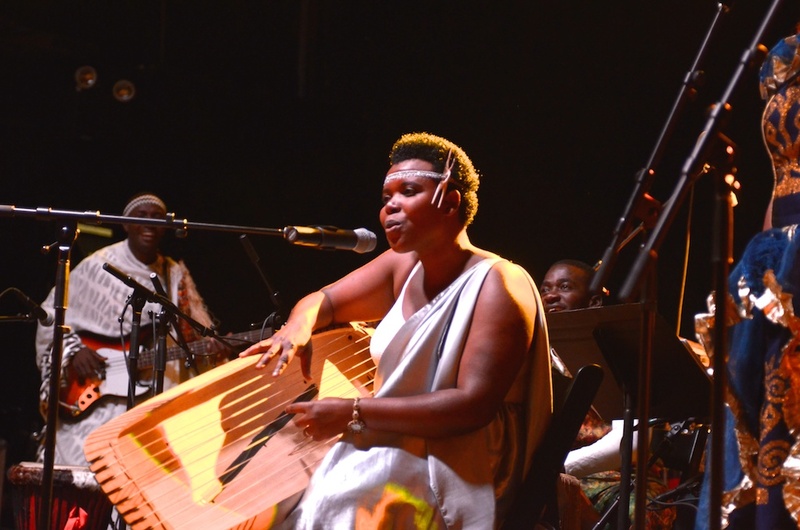 Sophie Nzayisenga (Rwanda): My instrument is called inanga. I was taught by my father, because he was also an inanga player. But nobody told me to start playing this instrument. I started when I was six years old, and I got the instrument from my uncle, who was also an inanga player. Inanga in our traditional culture is from the past. It is an immense instrument. It was played for the king, like the drums. Inanga was played at big gatherings, big shows. Now, inanga is played everywhere, even in churches. In Rwandan culture, singing and making poems go together. So when I’m singing I am also creating poems. When I play inanga, I use three fingers from one hand and three fingers from the other. One hand holds the high notes and one hand holds the bass notes. Inanga is made of wood--hollow like a boat. It has three parts: the back, which is called inanga, the edges which are called “inanga toes,” and strings. The strings are divided in three parts, high notes, medium notes and bass notes. Among all those strings, there is one string that goes from the top, from one toe and through another toe, and it comes back. So this one string zigzags from one edge to another. It's a zigzag string. I’m the only female playing inanga in my country. When I was a teenager, this was not well looked upon. People used to tell me that this instrument is for men, so you will never go anywhere with this instrument because you are a woman. But I was happy because when I was 10 years old, my dad got an award for teaching me inanga. That really encouraged me to keep going. Since then, I've been participating in many competitions and I have won many as well. When I was 9 years old I start going outside the country, abroad. So I can say that people inside and outside my country love what I'm doing. In general, what I face in the Nile Project is not really difficult because before I joined the project, I was a musician in Rwanda. But in the beginning, I did face some challenges. I used to be a soloist, to play alone on the stage. So this kind of experience of playing together with others was a little bit challenging at first. But when you live as a family with others, you learn from each other and you teach. Now in the Nile Project, we teach each other's music so learn and you finally get the music. In Egyptian music, or Ethiopian music, there are some scales that are really strange, complicated. But slowly, when you live as a family with the other musicians, and you communicate with them, you get in the mood, and you understand and you can overcome these challenges. 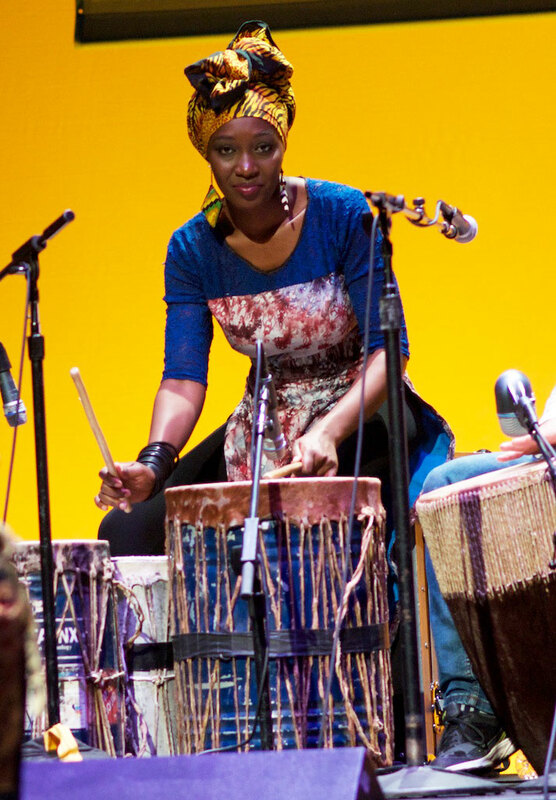 Being a female percussionist in Kenya is the most difficult thing ever, because the music industry is governed by men. The bigwigs in the industry are all men. Traditionally speaking, drums in Africa were seen as sacred instruments. They were used as part of communication, to evoke spirits in rituals, religious ceremonies, and rites of passage. This was very sacred in African traditional society, and it was a taboo for a woman to play drums or percussion. It was so serious that a woman could not go even near the space where these drumming sessions were happening. So breaking that rule, being a percussionist, has put me in a lot of trouble. I've had to face bullies and people who just don't believe that I can work it at the same level as male percussionists. I have had to prove myself all the time. I started playing at the age of 6. I was born in the village and I used to spend a lot of time with my grandma. Most evenings, she'd tell me stories of her young life, tales like “The Hare and Hyena.” And she had this little drum she used just to hit, not necessarily play, but just hit it as she told her stories. She also liked punctuating her stories with silence and telling me to listen to something for a very long time. She'd be like, “Shhhh Kasiva, do you hear that cricket? And do you hear that frog? Do you hear them shouting at each other? Or like, do you hear him complimenting his moves as a dancer?” Then I would really listen keenly, and through this practice, my ears developed a keen differentiation of sounds and rhythm. This rhythm is what captured my heart. I started hitting things, playing my thighs, and I would go to the door and just play things on the door. This went on for such a long time. Then I started going to school in Nairobi. I had a very strange childhood, because I didn't have friends. In Kenya, children go to school from morning until 4 o'clock in the afternoon, and at 5 o'clock on all the TV channels its cartoon time and all the kids are locked into it. You will not see any kid outside playing or riding a bike. Then at 6 o'clock the cartoons end and you see all the kids come out again and start playing. You see them ganging up in small groups: “Did you see Mickey Mouse? Did you see Pink Panther? Did you see the way Dexter slapped Dee Dee?” And in these sessions I had nothing to say, because I was not watching cartoons. I was watching this musical program that came on a certain channel. So when we all came out at 6 o'clock, I had nothing to say. I didn't see Dee Dee do anything to Dexter; I saw some guy killing it on the drums, or I saw this beautiful harp, or this beautiful singer. Later, I went to university in Uganda. But I carried my drum with me. My university was like 30 minutes away from Jinja, and that's where the river Nile starts. I used to take my drum to Jinja and I spotted this nice hotel which was right at the shore. I'd go there and sit with my iPod and my drum and play. The fishermen would be fishing and some of them would look at me real crazy. But it was so beautiful. Especially the sunsets were the best. The water was shining, it was like a million stars against the sunset and the fishermen. That was like heaven, man. So I started playing small gigs in Jinja in clubs, just for pocket money. I rehearsed a lot on my own, and then back in Nairobi I was working so hard. But some male percussionists were blocking my way all the time. I couldn't get gigs because they were leaping onto the gigs that I was getting. And sometimes, they were interfering with my reputation as a musician. Being a woman, it is very easy for someone to tarnish your reputation or your name. But then I found a band that was really open-minded, and they supported me so much. They're called the Gravity Band, and I still play with them now. They exposed me to artists and musicians—female musicians who love working with other female musicians. Through this, I got connected to the music industry. Now I'm professionally playing in Nairobi and thank God, I'm touring. It makes me smile. On top of it all, I'm happy. Right now, I'm feeling growth in my percussion because I'm getting to collaborate with all these amazing musicians from countries along the Nile Basin. Working with people like Sophie from Rwanda, who is the only female inanga player in her country, gives me a lot of motivation also. It’s a constant reminder that, Hey, you're not alone, girl. There are some seriously amazing female musicians who have gone through the same things, but look at them. They're like shining stars. When they're on stage you don't see anything like the suffering or the hardships they've gone through. You just see jewels on stage, shining and happy and doing their art just right. The Nile Project musicians are like golden tablets that I would lock in a safe and never lose because they are so precious to me. 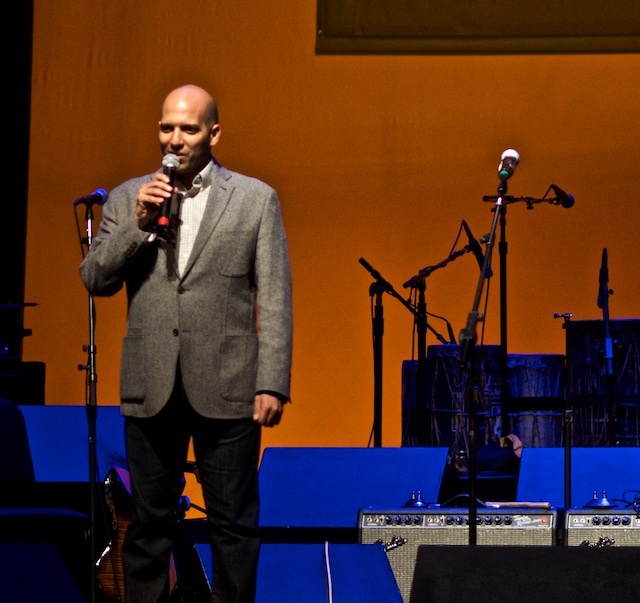 Miles Jay (U.S. musical director of the Nile Project): The energy of the musicians is basically a steady force. They're really hard working; their work ethic is great, their creative ideas and output of concepts is great. There is nothing I have to do to sort of get them to contribute. Its more a matter of seeing all this energy going sometimes in a general direction and sometimes in totally different directions and finding out the best way to harness it and shape it into a productive outcome. So that's my production supervisor role, is seeing what do we have in the room, what can happen here, who is an effective leader, who is an effective follower, who is more interested in supporting, who's leading the concept at the moment. Who feels a little left out, who do we need to draw in? And that changes song to song, moment to moment. In the planning stage, I spent a lot of time on YouTube searching for musicians, listening to their instruments. I defined the kind of timbral range and pitch range of all the instruments: percussion, vocalists, and strings and winds, everything, to come up literally with a six-octave spectrum of what instruments are going to fill each spectrum of the soundscape. Because I think the overall integrity of our sound, from bass to highest highs, is a big part of my job. 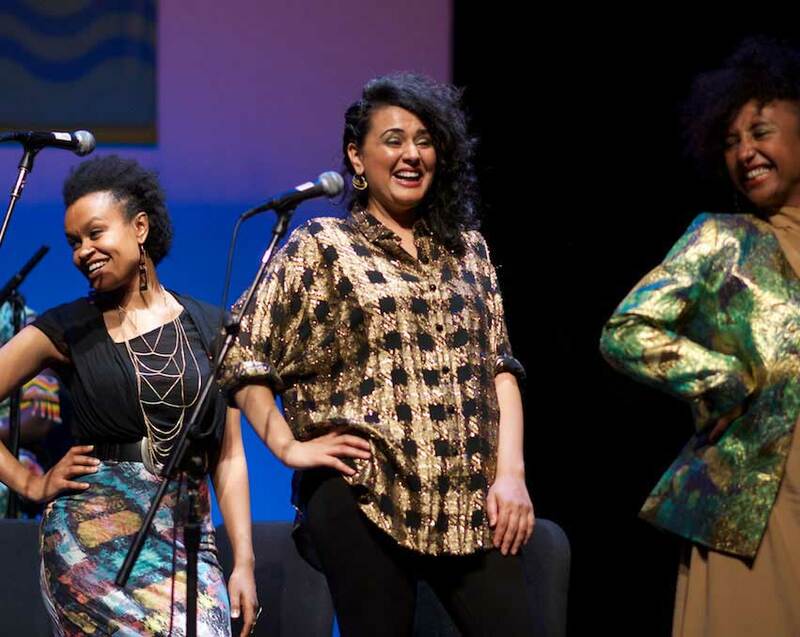 Everybody that sees the Nile Project is going to see a lot of active female musicians from this region, which they might not get to see in other types of media from that part of the world. And these girls, all of them, have had to struggle in their own regard. There's no female musician in the world that hasn’t faced her share of hurdles, sexism and gender discrimination. And as you can see, someone like Kasiva or Selamnesh or Dina can get the audience so engaged. In some contexts back home, in ultra conservative societies, that could be really threatening. Because that type of power could turn into anything, you know. 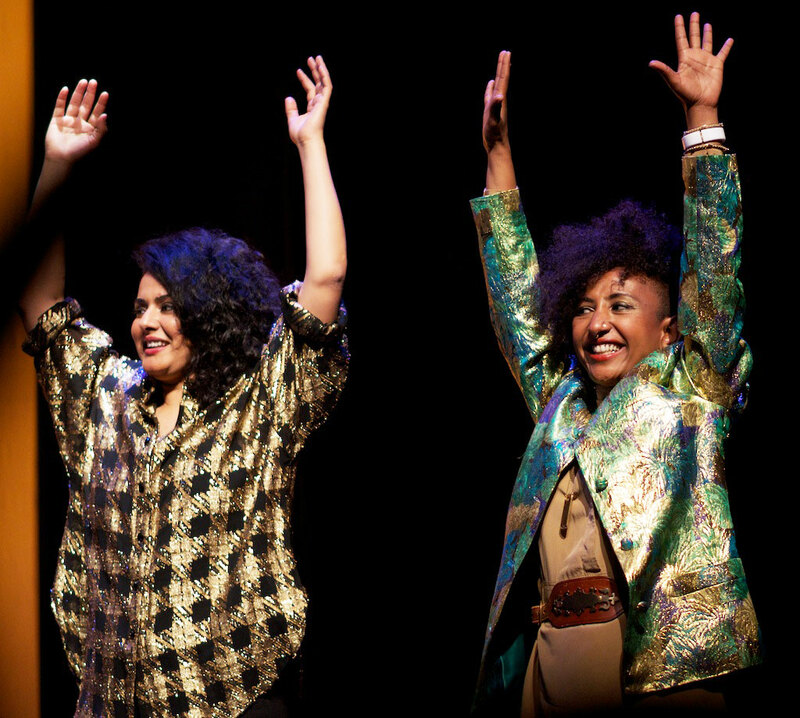 So in the Nile Project, we really want to create a space for those women's stories and experiences to be not only heard but spread wider than they currently are.